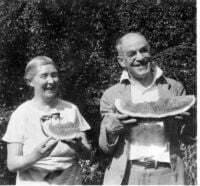 After a trip of two months, Mr. and Mrs. W. C. Byrne and Mrs. Ethelbert Lardin have returned from the Orient. Upon leaving San Francisco on the liner President, their first stop was made at Honolulu and this was followed by visits to Japan, China and the Phillipines. The Santa Cruzans enjoyed a most wonderful trip and spent the major portion of their time traveling in Japan and China. Santa Cruz Sentinel shows a Walter Byrne in Santa Cruz on 06 Jan 1891, as Treasurer for local Baptist Church Sunday School. Same Walter? Passport Applications, 1795-1905; (National Archives Microfilm Publication M1372, 694 rolls); General Records of the Department of State, Record Group 59; National Archives, Washington, D.C.
Passport Applications, January 2, 1906-March 31, 1925; (National Archives Microfilm Publication M1490, 2740 rolls); General Re. [S35] California Death Index, 1940-1997, Ancestry.com, (Provo, UT, USA: The Generations Network, Inc., 2000), Ancestry.com. California Death Index, 1940-1997. [database online] Provo, UT: Ancestry.com, 2000. Original electronic data: State of California. California Death Index, 1940-1997. Sacramento, CA: State of California Department of Health Services, Center for Health Statistics, 19--. [S13] 1900 United States Federal Census, Ancestry.com, (Provo, UT, USA: The Generations Network, Inc., 2004), Ancestry.com. 1900 U.S. Federal Census [database on-line]. Provo, UT: MyFamily.com, Inc., 2004. Original data: United States. 1900 United States Federal Census. T623, 1854 rolls. National Archives and Records Administration, Washington D.C. Santa Cruz, California, ED 89, roll T623 112, page 9A. [S117] Santa Cruz County Resident and Business Directory, 1910, Thurston, 32. [S14] 1910 United States Federal Census, Ancestry.com, (Provo, UT, USA: The Generations Network, Inc., 2006), Ancestry.com. 1910 United States Federal Census [database on-line]. Provo, UT: MyFamily.com, Inc., 2004. Indexed by ProQuest from microfilmed schedules of the 1910 U.S. Federal Decennial Census. Data imaged from National Archives and Records Administration. 1910 Federal Population Census. T624, 1,784 rolls. Washington, D.C.: National Archives and Records Administration. 3-Wd Santa Cruz, Santa Cruz, California, ED 128, roll 106, part 3, page 158B. [S115] San Francisco Passenger Lists, 1893-1953, Ancestry.com, (Provo, UT, USA: MyFamily.com, Inc., 2004), Online publication - Ancestry.com. San Francisco Passenger Lists, 1893-1953 [database on-line]. Provo, UT, USA: MyFamily.com, Inc., 2004.Original data - San Francisco, California. Passenger Lists of Vessels Arriving at San Francisco, 1893-1953. Washington, D.C.: National Archives and Records Administration, Micropublication M1410. Rolls # 1-429. [S17] 1930 United States Federal Census, Ancestry.com, (Provo, UT, USA: The Generations Network, Inc., 2002), Online publication - Ancestry.com. 1930 United States Federal Census [database on-line]. Provo, UT, USA: The Generations Network, Inc., 2002.Original data - United States of America, Bureau of the Census. Fifteenth Census of the United States, 1930. Washington, D.C.: National Archives and Records Administration, 1930.T626, 2,667 rolls. Santa Cruz, Santa Cruz, California, ED 8, roll 215, page , image 406.0. [S17] 1930 United States Federal Census, Ancestry.com, (Provo, UT, USA: The Generations Network, Inc., 2002), Online publication - Ancestry.com. 1930 United States Federal Census [database on-line]. Provo, UT, USA: MyFamily.com, Inc., 2002.Original data - United States of America, Bureau of the Census. Fifteenth Census of the United States, 1930. Washington, D.C.: National Archives and Records Administration, 1930.T626, 2,667 rolls. Santa Cruz, Santa Cruz, California, ED 8, roll 215, page , image 406.0. [S17] 1930 United States Federal Census, Ancestry.com, (Provo, UT, USA: The Generations Network, Inc., 2002), Ancestry.com. 1930 United States Federal Census [database on-line]. Provo, UT: Ancestry.com, 2001-. Indexed by Ancestry.com from microfilmed schedules of the 1930 U.S. Federal Decennial Census. Data imaged from National Archives and Records Administration. Fifteenth Census of the United States, 1930. T626, 2,667 rolls. National Archives and Records Administration, Washington D.C. Santa Cruz, Santa Cruz, California, ED 8, roll 215, page 8A, image 406.0. [S230] Santa Cruz IOOF Cemetery Records, Index of Cemetery Records of Santa Cruz County, (Santa Cruz Genealogical Society), Walter Charles Byrne, Michigan Native, Buried 24 Oct 1940, Age 72. [S65] Illinois Marriages, 1851-1900, Jordan Dodd and Liahona Research, comp., (Provo, UT, USA: The Generations Network, Inc., 2005).